I wasn't able to make it through a reading of The Undefeated without crying. Poetry is meant to be read out loud and, while I started with a strong, clear voice, it quickly turned to a whisper. I definitely carry white guilt, am horrible when it comes to talking about race and only slightly better when it comes to inequality, inequity and social justice. Alexander's began writing this powerful, elegant, moving poem in 2008 after the birth of his second daughter, just months before Barack Obama became the first African American president of the United States, saying, "This poem was my tribute to both." And, while I am tempted to share the whole poem here, or even lines, it is lifted up and intensified by the stunning oil paintings of Nelson. Some pages are portraits of individuals, while others show families and layered collages of many. There are historical figures and individuals. There is a two page spread left white, honoring those who did not survive life in America, and another, patterned with images of slaves and evoking the unthinkable conditions of a slave ship, is for, "the unspeakable." This refrain is repeated three times, moving from the Transatlantic slave trade to a spread featuring photographs of Addie Mae Collins, Cynthia Wesley, Carole Robertson and Carol Denise McNair, the glass in the frames shattered. These are the four children killed in the racially motivated 16th Street Baptist Church bombing of 1963. The final refrain is a contemporary memorial for the dead, with candles, flowers and stuffed animals, as well as photographs of Michael Brown, Sandra Bland, Tamir Rice and Trayvon Martin. As Alexander writes in his Afterword, this poem is " . . . about Black. Lives. Matter. About Black. Lives. Matter. About Black. Lives. Matter. Because we are Americans. Because we are human beings. and her friends and her family and all of you, and to remind myself, to never give up, because, as Maya Angelou wrote, "We may encounter many defeats, but we must not be defeated. It may even be necessary to encounter the defeat, so that we can know who we are. So that we can see, oh, that happened, and I rose. I did get knocked down flat in front of the whole world, and I rose." Those who rose and continue to rise are held up, from writers like Zora Neale Hurston, Phillis Wheatley, Langston Hughes, to politicians and activists like John Lewis and Martin Luther King Jr., to sports legends like Wilma Rudolph, Michael Jordan, Sheryl Swopes, Jesse Owens, Serena Williams, Lebron James and Reece Whitley to musicians like Thelonious Monk, Louis Armstrong, Miles Davis, Billie Holiday, Sarah Vaughn and Duke Ellington and Ella Fitzgerald. I probably shouldn't have listed all those names, and I left some out. 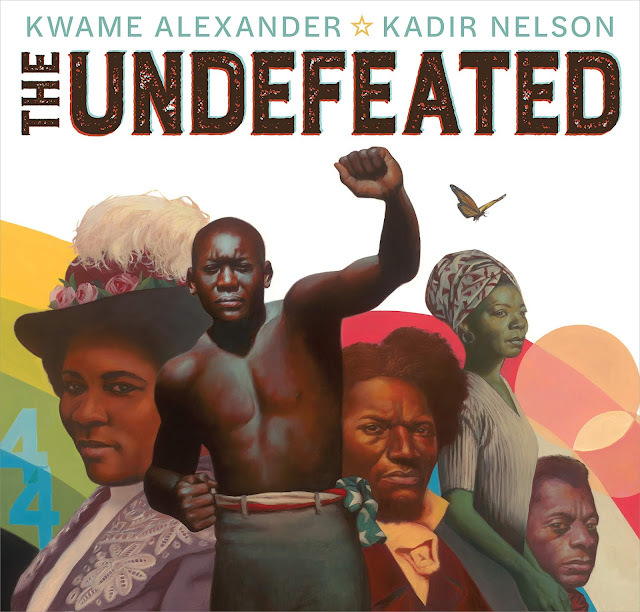 Back matter includes a list of Historical Figures and Events Featured in The Undefeated.